WASHINGTON – Supreme Court justices grilled Gilbert’s attorney Monday on the town’s sign ordinance, with one justice suggesting the town was “being unreasonable” with its limits on temporary signs. Clyde Reed, pastor of Good News Community Church in Gilbert, had challenged the ordinance saying its limits on sign size and duration violated his First Amendment rights to welcome people to his church’s services, which regularly change location. But an attorney for Gilbert, Philip Savrin, argued that the town has an interest in limiting signs to prevent clutter. He said that if the ordinance was overturned and cities and towns were forced to issue a “one-size-fits-all” ordinance for all signs, it would likely limit everyone’s speech. Gilbert’s ordinance says signs giving directions to an event cannot go up any earlier than 12 hours before the event and must be taken down within an hour after the event ends. But other signs, like political campaign signs, can be left up for five months and can be more than five times larger than the “temporary directional signs” at issue in the case. Ideological signs can be left up indefinitely, but must be smaller than political signs. In 2005, Gilbert officials cited Reed’s church after signs directing people to its services were left up longer than the ordinance allows. “The church’s signs are one-fifth of the size (of campaign signs) only placed in the dark of night, 12 hours before the church service,” David Cortman, an attorney for Reed, told the justices Monday. Cortman argued the ordinance violated the First Amendment because it distinguishes between categories of speech. Savrin argued that the ordinance does not violate free-speech rights because it is aimed at the type of sign, not the content on it. The ordinance is intended to reduce clutter and maintain driver safety, not to discriminate against one category of speech, he said. But some of the justices asked Savrin whether allowing political signs to be larger than other kinds of signs is discriminatory. “What if somebody doesn’t like politics? What if they say, ‘Politics is spinach. 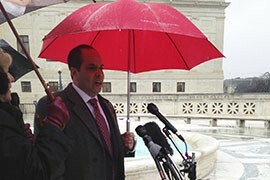 I want ideology,’?” Justice Antonin Scalia asked. Most of the justices appeared to struggle with the town’s justification for the ordinance, but Scalia was the most vocal, eliciting laughter from the audience on multiple occasions. “There’s as much a First Amendment right to give someone directions as there is to post a sign about being green,” Scalia said. The town’s ordinance was upheld in February 2013 by a divided 9th U.S. Circuit Court of Appeals, which ruled that the language was not content-based and could stand. A dissenting judge disagreed, and other circuits have split on the issue. Savrin said the town is “hoping for much-needed clarity in this area of law,” but he would not make predictions after Monday’s hearing. Reed and Cortman were more confident. “We aren’t asking for special treatment, we just want our town to stop favoring the speech of others over ours,” Reed said. 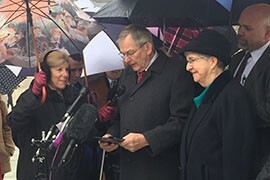 Pastor Clyde Reed of the Good News Community Church in Gilbert, outside the Supreme Court, where he challenged the town's sign ordinance as an infringement on his free-speech rights. 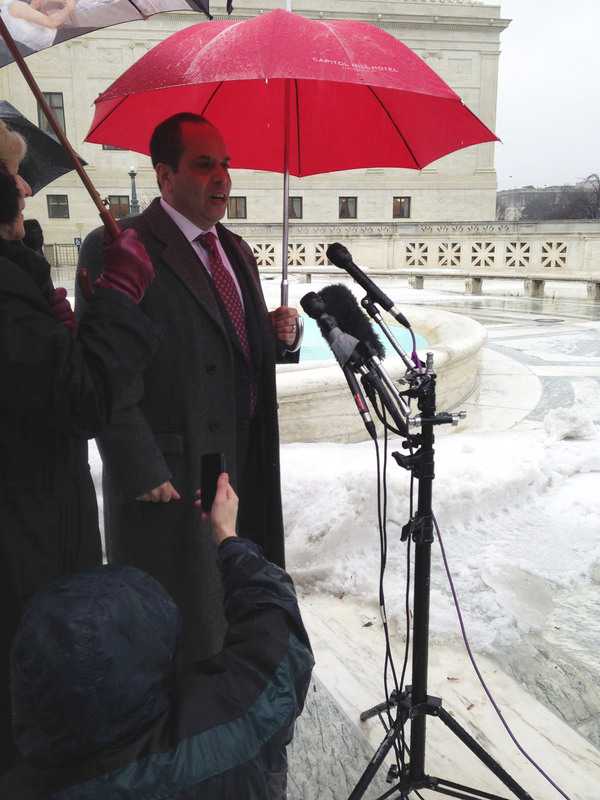 Philip Savrin outside the U.S. Supreme Court, where he argued that the town of Gilbert has a right in restricting signs to prevent clutter and protect public safety.